An ancient evil has arisen from the depths of the Earth. To defeat the Org forces, five mighty Power Animals from an ancient civilization choose five young heroes to become the Wild Force Rangers and protect the planet. Once part of the Earth, the land of Animaria was magically lifted into the sky to protect it from the Orgs, and is now known as the Animarium. It's turtle shape left a similarly shaped lake in its place, forming the basis for Turtle Cove. It is home to Princess Shayla, the Power Animals, and the Rangers. The sacred waters of the temple warn them of danger. 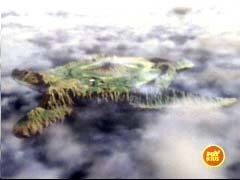 The Animarium remains in the sky, where Shayla and the Zords wait for the day they are needed again.